I have come to miss the communities of “she”. In coming closer to a “me” that better fit me. The wonder of Troubling the Line is that editors TC Tolbert and Tim Trace Peterson have allowed the book to be big and vehemently eclectic, and so the diversity of writers and poems across its pages is animated by such a rich diversity of identities that generalizing about them becomes impossible. For any seemingly useful generalization there is likely an exception somewhere here. For identities such as trans and genderqueer this is especially important, because these identities are so marginalized within the general culture that it is easy for even well intentioned readers to assume that such identities are predictable or able to be summed up in simple equations. 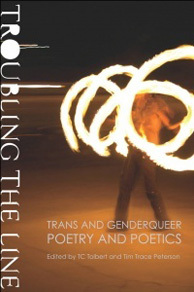 For the equation Trans/genderqueer poetry = x, this anthology offers at least fifty-five solutions for x. Though there is, thankfully, no single definition of trans or genderqueer or poetry herein, there are commonalities, overlaps, echoes, and reiterations. Bodies, borders, and childhood are often a topic of concern and consideration. The names of Gloria Anzaldúa, Judith Butler, and Audre Lorde come up regularly. There are almost no traditional, European poetic verse forms evident. But more common than commonalities are differences and multiplicities. The anthology’s organization heightens this effect: the poets are presented in alphabetical order of first initial (Meg Day appears between Max Wolf Valerio and Micha Cárdenas). Performance poets are next to Stein-influenced experimentalists who are next to confessional lyricists, and all of them are next to poets who mix up those (admittedly inadequate) categories with glee. One statement on poetics after another speaks to the queering of language and the queer will to language and the queer impulse within language, but often from vastly different, even contradictory, perceptions of queerness and of language. For some of these writers, poetry is a form of politics; for others, poetry is itself identity; for others, language is its own world; for others, all of the above, and then some. Anthologies are, by their nature, a mixed bag, and they are often problematic in appearing more inclusive and definitive than any single book about any but the most narrow of subjects could be. The genius of Troubling the Line is to start with that knowledge and to turn it into a mission statement and act of generosity. Because the book offers so many different types of poems and poets, it is impossible to see it as definitive—it suggests possibilities, not canons. There are no totalities here, even within specific poets’ work (“All those identities animate some of my poems”). Reading the book, with all its diversities, can be dizzying—and it’s a glorious feeling. Rarely do anthologies capture quite so much energy of expression. No reader is likely to find all of these poems to their taste, and that is part of the fun, because as we traverse the types and tones, we are challenged to define our own tastes, desires, and identities. Who am I when I read this book? we ask. And: Who might I be? Who cannot inhabit these words? Who cannot be thrilled, awed, beguiled by them? The poems and statements on poetics present paths and potentials. Some writers are their own subjects, others reject subjectification. Some writers claim a comfort within expressions of masculinity or femininity, others claim multitudes of gender identities, others write elegies to gender or celebrate its demise. The writers are of various ethnicities, various degrees of able-bodiedness, various classes and contexts. Lilith Latini’s biographical note states that she is “as yet unpublished in print,” while Stephen Burt has a poem in a recent (as I write this) issue of The New Yorker. To readers who assume that trans and genderqueer are stable, static, predictable, narrow identities, Troubling the Line stands as evidence otherwise. It is among the most diverse anthologies you are likely to read any time soon. Queerness is about the expansion of possibility and identity within selves, societies, and languages. We need more pronouns, not fewer. There are traditions even in this magnificent neologizing—traditions of orature and dialect, but also traditions deep in written languages and literatures: the writers in Europe before orthography settled down in dictionaries, or the lone wolves and idiosyncratics such as the writer redolent in Brolaski’s lines, Gerard Manley Hopkins. Queerness has always been among us. “We are attempting to sturdy and thicken a conduit for expansions,” writes j/j hastain. It would be another way to think of this book: not as an anthology, but as a conduit for expansions, a tool to trick out the “me” that better fits me, you, us. This entry was posted in Uncategorized and tagged Fall 2013 on January 3, 2014 by admin.